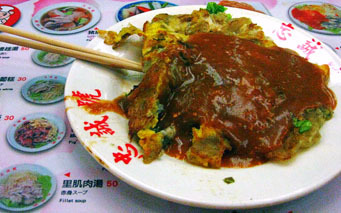 All Chinese people love their food, and Taiwanese know that the street foods are some of the best options. For authentic Chinese snacks Shilin Market can't be beaten, but Taipei is also a modern global city and you'll find cuisines from around the world represented here, sometimes with Chinese fusion twists and sometimes straight up. At the night market there is a food hall in the basement of the modern Shilin Market building, but while that is one major focus and must be visited don't think that this is all there is to see. Many stalls and even restaurants focus on one small variety of food, and by focusing on that they become expert and unbeatable in their quality and wonderful flavor. Combine eating and shopping on your visit! Here are some of the special flavors of Taiwan and the world you will find at Shilin. Oyster Omelet or Pancake - Pictured here this Egg and chives dish with fat juicy oysters is a must try! Stinky Beancurd - A specialty so special we've given it a separate page. Click the button to the right. Fresh fruit - but fruits you may never have seen, but each one tasty and special. Taiwan is famed throughout the world for its apples, but have you tried the pineapple apple or the custard apple? Try them! Chilled Fruit drinks and smoothies, not just your typical apple or orange but also exotic fruits like custard apples and things not normally seen in juices like Cherries. Rice noodles - which may sound plain, but when presented with a range of pickles and spices can be a tasty treat. Deep fried chicken steak on a stick - Only we Taiwanese can turn a Chicken into a snack on a stick! Deep fried, tasty and both crispy and moist this is a must-try. Freshly squeezed sugar cane juice - A childhood favorite of many Chinese people, try the sweetest juice squeezed from the hardest cane. International choices include Singaporean, Japanese, European and American foods. Both street stalls and shops along the narrow lanes. Interspersed with more snack stands.